Hunger is on the rise for the third year in a row with 821 million people across the globe going hungry. Watch the World Food Program USA's video on the four pillars of hunger that affect food security: availability, access, utilization, and stability. Join a discussion forum to share experiences, ask questions and explore technical or cross‐cutting topics in food security and nutrition. Are you taking full advantage of the FSN Network website? features of the online home of the FSN Network community. 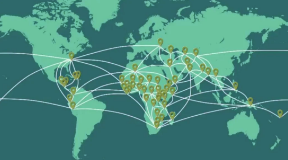 This platform is the online home for the FSN Network community of practice, where you can participate in online discussions, browse Task Force-recommended tools and over 700 resources, find and register for upcoming events, stay up-to-date on Food for Peace updates and relevant news, and review materials from past meetings and webinars. Up to 1.85 million people were caught in the deadly path of Cyclone Idai - the worst climate-related disaster to hit Mozambique this millennium - which made landfall on the country's coast on the night of 14 March. This photo collection by the World Food Programme shows the impact of, and response to, this devastating event. Browse photos and watch videos from FSN Network Knowledge Sharing Meetings, events, and more in our new gallery!